What can you do about dog car anxiety? Some dogs don't like car journeys, which can make life difficult for everyone involved. Even if you can exercise your dog close to home, there are likely to be occasions when you need to take your dog somewhere by car, e.g. to the Vets. And if you like to travel, then you may want your dog to travel with you whenever possible. This is why it is so important to get your dog used to car journeys as soon as possible. This is of course easier with puppies than adult dogs, but with the right techniques and patience, it can be done. The symptoms of dog travel anxiety can vary between dogs and range from mild to severe. The most common symptoms include shaking, heavy panting, pacing, excessive salivation, hyperactivity, barking or whining, vomiting, urinating, and defecating. There can be many reasons why your dog hates car journeys. His first car journey is likely to be when he as a puppy goes to his new home, i.e. leaving his mother and siblings. This makes his first experience of car journey quite traumatic. Then many dog owners are afraid of taking their dogs out and about until they have been fully vaccinated. This means valuable time to get the puppy socialized with the car may be lost. Even if you are not taking your new puppy somewhere, it is still advisable to get him accustomed to the car as soon as possible. You can start by getting him used to go in and out of the car. Then just sit in the car with your puppy to get him used to being inside the car. You can then start by driving to the end of the street and back, just to get him used to the movement. It is vital that this is always pleasurable and fun experience, i.e. to build up positive feelings towards the car. Use toys, treats, and lots of praise to achieve this goal. Few minutes per day with young puppy can be enough to make him comfortable with car journeys… hopefully for the rest of his life. And when you start taking him out, make sure the first car trips end is something enjoyable, i.e. take him to the park, not to the Vet. If you (or previous owner) have failed to get your dog used to cars as puppy, then you may have a dog that doesn't like car journeys. And especially if the dog has had bad experience with cars in the past, e.g. been in an accident. Or if he only goes in the car to go somewhere he doesn't like, e.g. to the Vets. Dogs that suffer from motion sickness may also associate car journeys with being sick. Puppies are more prone to motion sickness than older dogs. If your puppy suffers from motion sickness, you need to deal with that as soon as possible, i.e. so he does not associate car journeys with being sick for the rest of his life. Not all is lost though, it is never too late to build up positive association with car journey, but it requires time and patience from the owner. How best to deal with car phobia in dogs? The best way to deal with dog car anxiety is to teach the dog to associate car journeys with something enjoyable. How easy it is to do depend mainly on how severe and deeply rooted the problem is. If your dogs travel anxiety is severe, then you may need to get professional help to deal with it. Working with dog behaviour counsellor on desensitization or counter-conditioning may be recommended, sometimes combined with the use of anxiety reducing medication. However, for majority of dogs, implementing few changes may be all that is needed to significantly reduce the dogs travel anxiety. Training dog for car travel involves relieving his stress. Your attitude is therefore the first thing to work on, i.e. 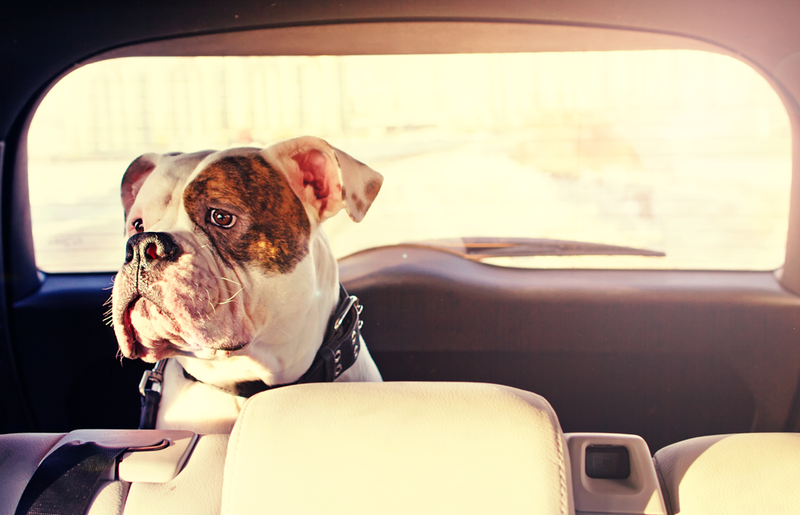 make sure you are calm and upbeat whenever you take your dog on a car journey. If you are stressed, or agitated, your dog will be stressed and agitated as well. The next thing is teaching your dog to associate car journeys with something desirable. It may take only few enjoyable short trips to resolve mild dog car anxiety. Take your dog on a short car journey with something enjoyable at the end, e.g. walk, his favourite game, or meeting other dogs. End the return journey as well with something he enjoys, e.g. his favourite treat, or quick game. Slowly increase the length of the car journey, until your dog is happy to go with you anywhere in the car. The most important thing is to keep the whole process enjoyable for both of you. The more time and effort you put into getting your dog to associate the car with something enjoyable, the quicker you will see results. 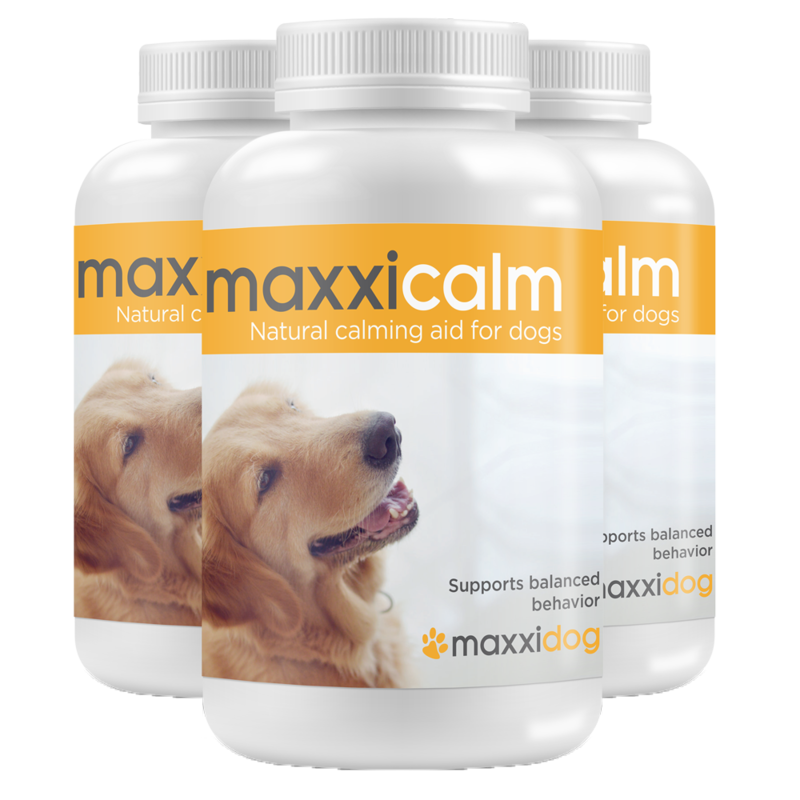 Using good quality calming aid for dogs, like maxxicalm, can help your dog deal with his travel phobias and speed up the process. Many dog owners give their dogs natural calming aid for longer car journeys, and when flying with their dogs. For best results, the calming aid should be given for few weeks prior to traveling. Classical music can also help your dog to relax in the car. There are special CD's for dogs available, e.g. on Amazon. 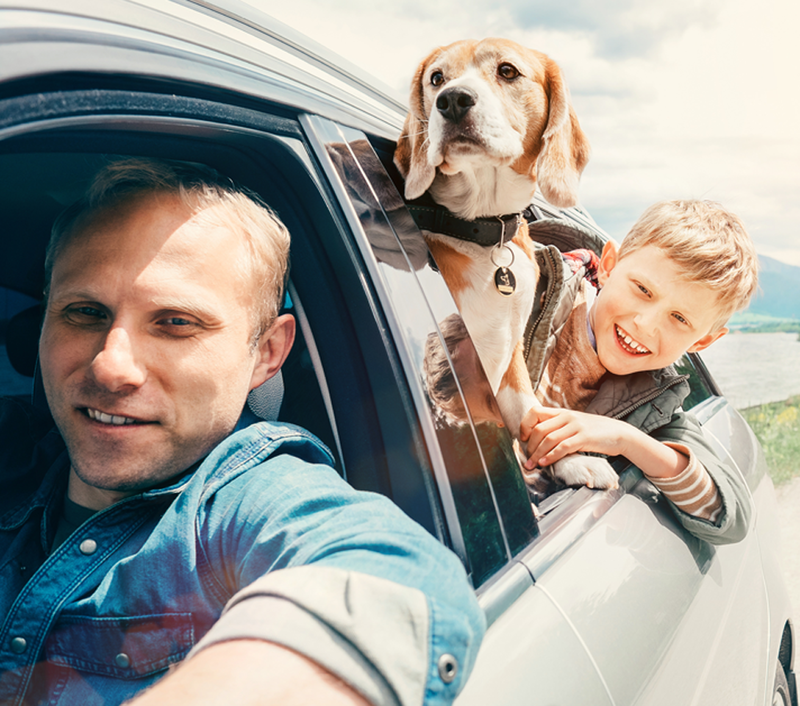 Now you can take your dog on car journeys, these tips will make the journey as comfortable as possible for your beloved dog. If you are taking your dog on a long car journey, make sure you exercise him properly beforehand. This will make him tired and therefore more likely to relax. What's more, exercise increases the natural serotonin levels in the body, but it acts as sedative. Don't feed your dog before taking him in the car. Ideally, he should not have eaten for at least 3 hours before car journey, i.e. to reduce the risk of motion sickness. Make sure your dog is as comfortable as possible in the car, it will increase the likelihood of him relaxing. He should be restrained somehow, both for his and your safety. Dog travel crates are excellent option if they fit in your car. The other option is to use dog safety harness for your dog. If your dog is on the car seat, put a blanket or dog bed on the seat for added comfort. If your dog is in a crate, make sure there is nothing in there with him that may harm him. Leashes and loose collars can present a strangling hazard. Provide toys or treats to keep him occupied when not sleeping. Chew toys may be preferable over bone or food treat, at least if the dog is prone to carsickness (and for your own sake you may want to avoid squeaky toys). Keep his collar and dog tag on throughout your journey, just in case your dog is separated from you. Stop regularly for bathroom breaks and for stretching the legs. Make sure your dog gets enough fresh water to stay hydrated. And never leave your dog in the car on a hot day. Even with the windows open, the car can quickly turn into an oven, and your dog will get dehydrated. Heat stroke can be fatal for dogs… and it does not have to be that hot so be very careful about leaving your dog in the car. Getting your dog used to car journeys is so important. It will make your everyday life so much easier, as well as opening the opportunity of travelling with your dog... and dogs are great travel companions. Dogs do not travel as light as one might think. You need to pack quite a few things for your dog. Click on the photo to download and print your FREE travel packing list for dogs.